I’m a big fan of TV competition shows to find the next Food Network Star and the next design star. So you know I’d love it when someone takes that great idea and brings it to a level that you and I can benefit from. So let me tell you about my friend Linda Claire Puig and her great idea. It’s not only a contest with some great prizes and exposure, but it’s also the kickoff to nearly a month of newsletter-related, events, learning, prizes and exciting opportunities related to newsletters and creating newsletters — easily — that can massively affect your business growth. If you have a newsletter, enter it THIS WEEK in the contest. (I’m entering mine!) Nominations close Sunday, July 25, at 9 pm Pacific, and voting is the following week with winners announced August 2. If you don’t have a newsletter (YET! ), definitely go anyway. This is a SUPER-RARE opportunity for you to see what your peers are doing with their newsletters and to take advantage of Linda’s free resources and expert newsletter information. You’ll get educated. You’ll get inspired. And my hope is you’ll get into ACTION! ALSO, be sure to register for the free webinar that Linda’s giving on August 2. 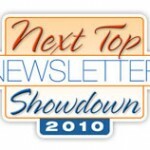 In addition to announcing the winners and exploring WHY they’re winners, she’ll also reveal some of the newest trends affecting newsletters and let you know about some BRAND NEW resources that will help you get going (easily!) with your own newsletter. When you host your own contest, you will be perceived as a leader in your field. 1. Build a list of people who are interested in your topic. 2. Build credibility with that audience. 4. Get a lot of great ideas from seeing the entries. 5. Network with the contest entrants. 6. Create a news story for the media. 7. Become an expert source for the media. 10. Set yourself apart from competitors. What contest could you hold? What partners can help you promote it? How will get the word out? What will the winners receive? How can you make money from the people who follow the contest? How will you get the word out to the media so you can be seen as the thought leader? Answer these questions and you’ll be closer to being seen as the leader in your field. This article can be re-printed on your website, blog or ezine.